This website is maintained in the spirit of collecting all things valuable to an international community interested in preserving the legacy of Ernest Bloch. In 1976, in this same wayside, the Governor of Oregon along with Bloch’s three children dedicated an Ernest Bloch Memorial. The site of the memorial was several hundred feet from the house in which the Blochs lived from 1941 to 1963. Ernest Bloch died in 1959. Marguerite Bloch died in 1963. 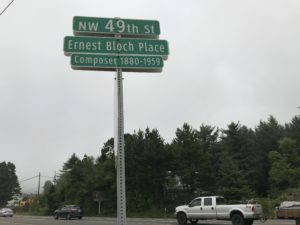 In 2017 the Oregon Department of Transportation named this wayside in the Agate Beach district — the Ernest Bloch Memorial Wayside. 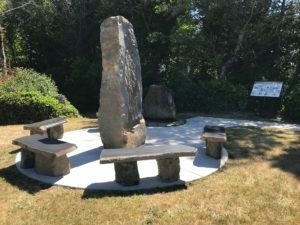 On July 21, 2018, the larger Ernest Bloch Memorial Wayside was formally dedicated, with the the 1976 Memorial being moved to and included in a new installation featuring a new monument, five benches, and an interpretive sign*, now referred to as Ernest Bloch Place. This site is maintained by Dr. Frank Jo Maitland Geltner, the “Flamekeeper” of the Ernest Bloch Legacy Project — which is based in Newport, Oregon, the home of Ernest Bloch from 1941 to 1959. *Copies of interpretive sign are available on request. The original (full size) is thirty-six by forty-eight inches; the copy (half size) is eighteen by twenty-four inches. Click on “KioskFinalPRINT” to view. A framed version is $60 plus shipping. A version suitable for framing is available for $30.00 (18 by 24 inches) plus shipping.